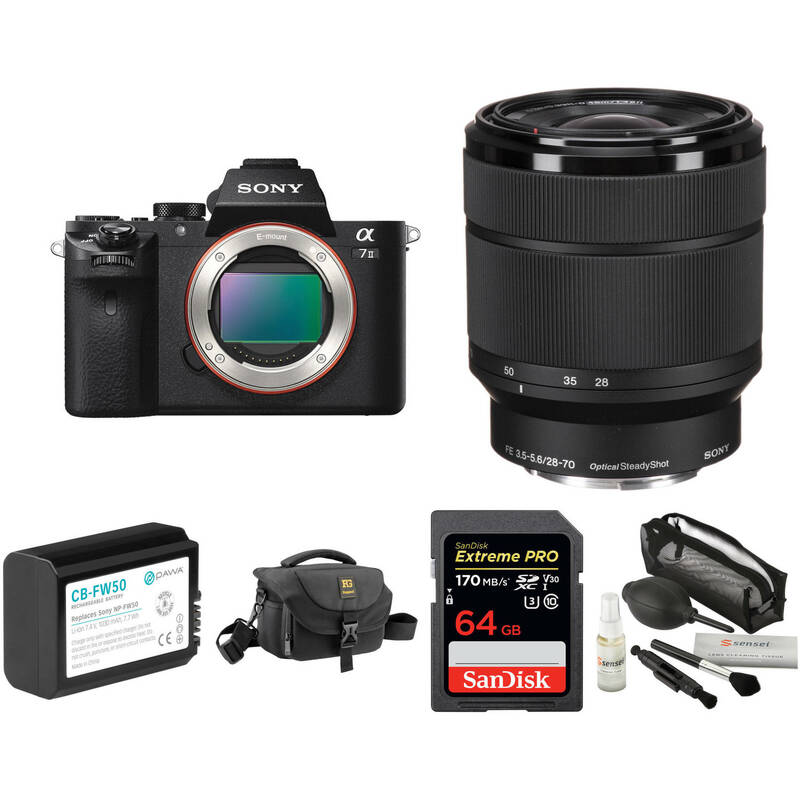 Comprised of everything needed to begin shooting, the Sony Alpha a7 II Mirrorless Digital Camera with 28-70mm Lens Deluxe Kit from B&H includes the versatile full-frame camera along with a standard zoom lens, memory card, a spare rechargeable lithium-ion battery, and a protective camera bag. Sony has taken their line of full-frame cameras to the next level with the Alpha a7 II Mirrorless Digital Camera with FE 28-70mm f/3.5-5.6 OSS Lens, which features 5-axis SteadyShot INSIDE image stabilization with 4.5 stops of compensation for pitch, yaw, horizontal shift, vertical shift, and roll. Operation of the 24.3-megapixel series has been streamlined with a redesigned grip, shutter release button, and customizable controls. The a7 II also features a moisture- and dust-resistant design with a magnesium alloy body and a more robust lens mount. And, with refined algorithms and better utilization of the BIONZ X image processor, the a7 II has an enhanced Fast Hybrid AF system that is about 30% faster than the previous model along with a 5 fps burst rate with continuous autofocus as well as a 40% faster start time. Bundled with the a7 II in this kit is the FE 28-70mm f/3.5-5.6 OSS E-mount lens. This wide-to-portrait zoom incorporates three aspherical elements and one extra-low dispersion element into its design to minimize chromatic aberrations and enhance overall image clarity. An optical SteadyShot image stabilization system has also been added to minimize the appearance of camera shake to suit working in dim lighting and with low shutter speeds. This stabilization will work with the in-body stabilization found in the camera. It has a minimum focus distance of 11.8". Designed for SD devices that can capture Full HD, 3D, and 4K video, as well as raw and burst photography, the 64GB Extreme PRO UHS-I SDXC Memory Card from SanDisk has a capacity of 64GB, is compatible with the UHS-I bus, and features a speed class rating of V30, which guarantees minimum write speeds of 30 MB/s. If your device does not support the V30 standard, this card also supports the U3 standard, which likewise guarantees minimum write speeds of 30 MB/s. Read speeds are supported up to 170 MB/s and write speeds max out at 90 MB/s. A built-in write-protect switch helps to safeguard against the accidental erasure of card data. As with most SanDisk cards, this memory card is shockproof, X-ray proof, waterproof, while also being able to withstand temperatures from -13 to 185°F, allowing you to take this card with you into extreme environments, such as snow, deserts, and pools. Should the card's data become compromised, you also benefit from the option to download RescuePRO Deluxe software as well as a limited lifetime warranty. Once the shots are taken, your work is only half done. Accelerating your workflow means you can carve out more time to take your creativity to the next level. Sometimes speed is what you need. The SanDisk Extreme PRO UHS-I SDXC card delivers the performance to capture uninterrupted 4K UHD video. Rated UHS Speed Class 3 (U3) and Video Speed Class 30 (V30), the SanDisk Extreme PRO UHS-I SDXC card lets you capture sequential burst mode shots. Built for and tested in harsh conditions, the SanDisk Extreme PRO UHS-I SDXC card is shockproof, X-ray proof, and waterproof, while also being able to withstand temperatures from -13 to 185°F. Includes an offer for RescuePRO Deluxe 2-year data recovery software, which lets you restore images you accidentally deleted. Registration is required. Box Dimensions (LxWxH) 9.528 x 6.142 x 5.669"
Box Dimensions (LxWxH) 17.0 x 10.5 x 5.0"
Alpha a7 II Mirrorless Digital Camera with 28-70mm Lens Deluxe Kit is rated 4.5 out of 5 by 218. Rated 5 out of 5 by Anonymous from Stunning!!!! A++++ I have been a Nikon user for many years and enjoy recreational photography. I recently bought this beauty with the 24-70 F4 Sony Zeiss lens as didn't like the kit lens. This is a serious piece of equipment which delivers astounding results. The image stabilization with a native lens is unparalleled to any other cameras available in todays market. It is compact compared to the other Full frame D-SLR's, its built solid with awesome low light photography results. I haven't owned it for long, but have a strong feeling its going to be my camera of choice for many years to come. Try one out and you will know exactly what I am referring to. Rated 5 out of 5 by Photokimet from With me always I bought this to supplement my Nikon D800. Although I love my Nikon, it's a bit much to have with me all the time (to the office, into NY in crowds) and wanted to have something that I could carry all the time. So far, I've kept the Sony on auto just to get use to all the bells and whistles and handling and I'm just about ready to switch over to full mamual. Loving this camera, the portability, and the results. The dials are the 'opposite' of my Nikon but that's no biggy. The only con is the battery life - solved by buying an extra battery & charger. Now I just have to sell off my D7000 with accessories and lenses! Rated 5 out of 5 by Dave the Great from A7 mark II is a great shooter. This is a professional step for Sony. Its processor is fantastic, autofocus is fast and the camera comes with a nice kit lens. The 5-axis stabilizer is a savior in many situation, as well. The camera is also equipped with a direct manual focus which helps a ton when you need to really get a sharp shot and the light is too low for the autofocus to get there. It get you there 90% and then the last 10% your adjust manually. It's an awesome feature. I recommend this camera for almost anyone who's trying to get into professional photography. Full frame camera that's compact and less than $2000? It's a great deal. Rated 5 out of 5 by james from Great camera at current price for right use Now the A7II is being eclipsed by the A7III, is this still a valid choice at $1,000? For some people, yes! I am only using MF lenses. 5FPS is plenty, mostly only shoot in single mode anyhow. 24MP is all the resolution I need or want. The EVF of the A7III is not any better than the one in the A7III. I don't use the video camera in the A7II. What does this camera offer? 5 axis IBIS is nice both for the ability to handhold at slower speed and having a steadier VF image when manually focusing. Better ergonomics than the original A7 and better built and better feeling body in the hand. If the A7III had the EVF of the A9 or A7RIII I would be tempted to pony up the extra $1K. Rated 5 out of 5 by Dave in Atlanta from Great Camera! 5 Axis in body stabilization Rocks. I have a number of lenses with no OSS. I was considering selling my Tamron 70-200 2.8. I used it on my A7 and would get motion blur on quite a few frames shooting in low light conditions. I can hand hold now with the same lens on the A7MK2 at 200mm and get sharp images at 1/60th! The changes to the ergonomics of the camera are also a plus. Better shutter release position and addition of two programmable function buttons on top near the shutter release. ++++++ Keep up the great work Sony! Rated 5 out of 5 by Anonymous from excellent for old manual lenses The niche that this camera fills is a relatively-compact camera with a full frame sensor, which is easily adapted to nearly any lens system out there, plus image stabilization on the Mark II. It fills this mission very, very well. The cons are minor and don't interfere with that fundamental function: - Battery capacity is small and you need to have spares around. - The EVF switches on using a sensor when you put the camera up to your eye. This sensor often activates when you don't wish it to, turning off the screen on the back when you are using it. The EVF can be temporarily disabled in the setting menu to fix this. - When using heavy lenses, the grip surface is smaller than ideal, compared to a full size dslr. Rated 1 out of 5 by Canandaigua Man from Faulty Image Stabilization System Bought this camera and several Sony/Zeiss lenses in February 2015. On a recent trip the camera failed with the message Camera Error. Turn Power off then on. Unable to reset the camera and a Web search indicates that this is a common problem with this model and confirmed by Sony. Have sent the camera for repair under warranty, but I am not hopeful this will not happen again in a few months when the warranty has expired. Other than this, the camera takes good pictures. A $ camera should not fail in this manner after less than a year of light to moderate use. And, Sony does not cover the cost of sending the camera to the repair center. How does the A7II compare with the Nikon D7200? I take mostly landscapes and nature shots but I don't do a lot of video recording. The A7II is a Full Frame Camera, compared to APS-C on the D7200. For landscapes the larger sensor will allow for wider shots. Do you take trade - ins? I have a Sony NEX 6 body that I would consider trading up to the 7II. For a trade-in, please email us directly at &lt;a href= http://usedphoto@bhphoto.com target= _blank &gt;usedphoto@bhphoto.com&lt;/a&gt; for more information. Sony states on page 88 of the instruction manual that continuous video shooting is possible for approximately 29 minutes (a product specification limit). The table on page 88 lists the estimated length or recording that may be captured on a memory card of a given size, but the longest time for a single clip would be 29 minutes. Pages 88-90 lists more information referring to recording times. Does the a7II have full pixel readout, no line skipping for video? i'm not sure what you mean by full pixels readout. If you mean that you can see what the lens is seeing on the LCD screen my guess is yes. I only use the LCD screen and never bring the view finder to my eye. It's like using an old fashion medium format camera where you hold it waist high and look down to see the scene. I have not used the video very much. My limited use has given me very good results. No issues. Does the A7II have full pixel readout video like the A7SI &amp; II? If not how would the pixel binning compare to the cams with full pixel readout? Unfortunately it does not have the full pixel readout or 4K HDMI output of the A7S. The pixel binning method employed on the sensor seems similar to before, which results in occasional aliasing and some moire too. Does this camera shoot video in 4k? I am videographer and trying to see which sony will work best for me since I use canon.